I wasn't on the receiving end of any tricks yesterday, but I did receive the wonderful treat seen in the photos below. For those of you who can't read Japanese, the game that serves as the focus of said photos is Character Soft's Hello Kitty World for the Famicom. More information on this helium-filled platformer can be found in this previous blog post, by the way. 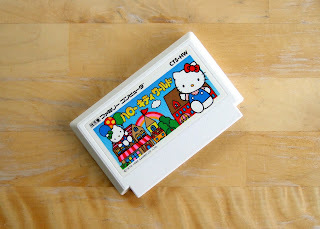 Also, for a few more photos of Hello Kitty World's box and cartridge, check out my Flickr photostream. Other than all of that, expect a "Great Gaymathon" review of this Japan-only title to be published in the next week or two. Hello, Anne! Yeah, I especially like the cart myself. As for what I paid for it: I can't remember at the moment! It wasn't much, though -- somewhere between $10 and $20, I think? Nice find! I have a few Hello Kitty games but I just realized that this one is still on my want list. Love that box! Thanks, Sean! 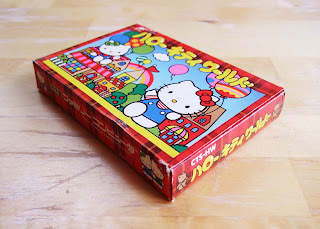 I'm not usually a Hello Kitty fan -- not that there's anything wrong with being one, of course! -- but this game is too fun to pass up. 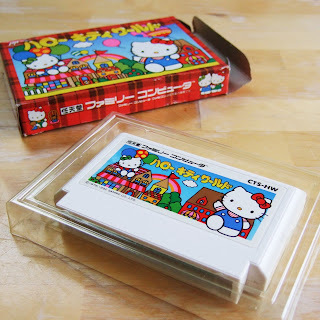 Something everyone should know about Famicom box art is the following: Famicom box art > NES box art .... That is all! Yes, Justin! Hooray! Have you ever played this game, BTW? If not, you should do so via emulation at some point. Or try Balloon Kid, for the GameBoy. I think you'd like either/both of them. Famicom Freak: I agree 100 percent. Sure, some NES box art was quite good, but most of it paled in comparison to Famicom box art. I should find one or both and an emulator, that is true. I can help you RE: choosing the right emulator, etc., if you need it, by the way!